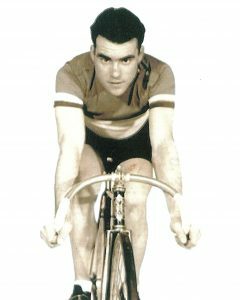 Cyclist and velodrome builder Albert (Schelstraete) Coulier’s incredible story began in Longpre, France with his birth on November 15, 1918. Albert and his family moved to Canada in 1927. From then on his story has been nothing but remarkable. As a youngster, he rode his first bike, a Royal Jenny, which he received in 1931, from home to church in Wallaceburg every Sunday, an eight-mile trip on very bad clay and gravel roads. In 1933, the family returned to Europe where he purchased his second bike, a Renoma and competed in a race for boys under 15. It was there that he learned first-hand what cycling competition was all about. He skinned himself from knees to shoulders but he was not deterred. Upon returning to Canada the family settled in Tillsonburg and a short while later, in 1934, moved to a farm in the La Salette area of Norfolk County where they lived for 45 years. In 1937, after winning two important events, Albert again competed in Europe as an amateur where he took part in 39 road races and one track event and won four races and finished in the top 10 in several others. In 1939 the Norfolk Cycling Club, which later became the Silver Spokes Cycling Club, was formed, and the first outdoor velodrome was built on the Brantford Road in Delhi. At this time Albert was one of the top three riders in Canada. After winning 6 night races in Delhi in 1939 and in 1940, Albert was offered a pro contract to compete in the 1940 Chicago Stadium race and two more 6-day events at the Montreal Forum. This was the end of racing until after the war. After the war, Albert promoted the first race at the Tillsonburg Fairgrounds with close to 2000 paid spectators. It was here that Pat Murphy, the club’s All Canadian Champion and Olympic cyclist won his first race. With talk of a new arena in Delhi, Albert began to design a completely portable track but it required an area 85 feet wide. After discussions with the Steering Committee, the Delhi Arena was built 85 feet wide instead of the standard 80 to accommodate the track for the summer months. After much hard work and considerable expense, the track was assembled in the spring of 1948 at the Simcoe Fairgrounds. From there it went to Quebec and then to the Delhi Arena. After the first portable track, Albert built many other tracks in cities across Canada and the U.S.A. including the World Championship track at the University of Montreal and the Olympic Velodrome for the Montreal Olympics in 1968. In 1972, Albert represented Montreal in cycling at the Munich Olympic Games. Since 1979, he has placed 7th, 8th and 16th in the World Cup in Austria; came 5th in the Belgian Olympic Series in 1979; was 4th in the European Masters World Series; won the first American Cup for Masters in 1979 and finished 2nd in 1980; won 2 bronze medals in the Masters Games in Toronto in 1985; won 2 silver and 1 bronze in the United States National Senior Classic in St. Louis in 1989; in 1993 won the Annual Casa Grande 25 mile event with 127 starters with a time of 50 minutes; and won the Ontario Masters Road Championship by one second. In addition to all of this, he was president of the Norfolk Cycling Club for many years, and continued to be a coach and mentor to young cyclists. He designed and built a bicycle built for 15 riders to be used for fundraising projects. He later designed and built a bike for seven riders and to celebrate his 60th birthday, he cycled from Windsor to Florida.